There are many myths and much misinformation about white and deaf boxers. This is largely due to the fact that for many years, a white coat was a death sentence for a boxer puppy, and breeders routinely killed their white puppies. However, white boxers are wonderful dogs, as beautiful and fun as their fawn and brindle counterparts! The vast majority of them suffer no disability as a result of their coloration, and those that do can still enjoy a long and happy life with just a little accommodation. Below you will find answers to some frequently asked questions about white and deaf boxers. Q: Are white boxers rare? A: White boxers are not rare. According to the American Boxer Club, white boxers make up 25% of all boxers born to parents with white markings. Since there are many flashy boxers in the US, many white boxers are born every year. Q: Are white boxers a recent development in the breed? A: White boxers have been around as long as boxers have, and though it is not considered appropriate to breed them today, they were even included in early German boxer breeding programs. It wasn’t until 1925 when the use of white boxers for breeding was banned in Germany due to the fact that white dogs are more visible and, therefore, less suitable for guard work. Q: Are white boxers albino? A: No. Albinos completely lack pigment in their skin, hair, or eyes. White boxers have mostly unpigmented fur, but they typically have dark noses, dark eyes, and patches of pigmented skin under their fur. White boxers are not the result of any genetic birth defect; they are genetically normal dogs who have white fur. Q: Are white boxers deaf? A: White boxers are more likely to be born deaf than are fawn or brindle boxers, but even still, the majority of white boxers can hear. There are no definitive figures regarding the incidence of deafness in white boxers. However, geneticist Bruce Cattanach conjectures that because the mechanism for deafness in white boxers and Dalmatians is the same, the incidence of bilateral deafness in white boxers is probably similar to that in Dalmatians – around 8% in the US. White boxers are not more likely to develop deafness later in life than are fawn or brindle boxers. 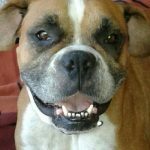 Q: Do white boxers have special health considerations? A: Some people claim that white boxers have a higher risk of developing cancer than do fawn or brindle boxers, but this has never been proven to be true. White boxers, do, however, sunburn more easily, and sun exposure can contribute to skin cancer. Using doggie sunscreen, putting a t-shirt on your white boxer, and, of course, limiting sun exposure during the midday can help reduce their risk of sunburn. Q: Do white boxers behave differently than colored boxers? A: White boxers are exactly the same in temperament as their fawn and brindle siblings. Q: Can white boxers be registered with the AKC? A: While the AKC does not recognize the use of white boxers for breeding, they do offer an American Kennel Club Limited Registration and will assign the dog an AKC number for use in performance events, such as obedience and agility. Any puppies produced by a dog with a limited registration will be denied registration by the AKC. Q: What causes deafness in boxers? A: While many dogs acquire some degree of hearing loss with age, congenital deafness in boxers is usually caused by the lack of pigmented skin in the inner ear, resulting in the atrophy of nerve endings within a few weeks of birth. Q: Do deaf boxers have special health considerations? A: No. Congenital deafness in white boxers is not associated with any other health issues. Q: Are deaf boxers trainable? A: Yes, deaf boxers are trainable. All dogs are natural masters at using and reading body language, so while deaf dogs can’t learn voice commands, it should come as no surprise that they can learn hand signals. Dogs born deaf also are very attuned to other stimuli around them, like vibrations in the floor and changes of light, and you can take advantage of these stimuli for training purposes. Deaf dogs are as trainable as any other, but they may require that you learn new techniques and skills. Q: Can I take my deaf dog on off-leash walks? A: As a general rule, deaf boxers should never be allowed off-leash in unenclosed areas. Since they will not hear you if you call them, you must remain in physical control of your deaf dog anytime there is a danger of him running off or getting into trouble. Q: Are deaf boxers aggressive? A: Deaf boxers, like hearing boxers, have individual personalities, and they are not more likely to be aggressive than any other dog. Some people worry that deaf boxers will react aggressively if they are startled by touch. However, deaf dogs are accustomed to their disability, and just because it is easier to surprise a deaf dog does not mean the dog will respond inappropriately when startled. Additionally, deaf dogs can (and should) be desensitized to touch using positive reinforcement. A: No. Deaf dogs adapt well to their disability and do not necessarily require another dog whose lead they can follow. Oftentimes, any new dog (hearing or deaf) will follow the lead of a pre-existing dog (hearing or deaf) in a household. 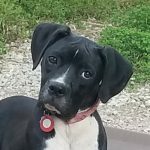 Our determination about whether a particular foster dog must, may, or may not be placed with another dog is based on the dog’s individual temperament and preferences, as well as its compatibility with dog(s) already in the home, and is independent of the dog’s status as hearing or non-hearing. * The Deaf Dogs Education Action Fund and Deaf Dogs Rock both have sections on training deaf dogs and also on resources for you and your deaf dogs. Conrad, Robert and Ann Gilbert, “Coat Colors in Boxers and the American Boxer Club,” http://www.americanboxerclub.org/white.html, (July 3, 2015). 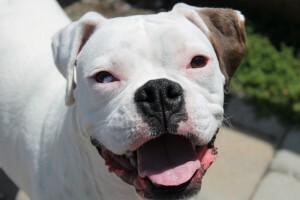 Cattanach, Bruce M., “White Boxers and Deafness,” http://americanboxerclub.org/white-deafness.html (July 3, 2015). “What Causes Deafness in Dogs?” SPCA of Texas, http://www.spca.org/Document.Doc?id=97, (July 3, 2015).